New Orleans Public Belt Railway, Class-8-DE-900/1E-2. Road # 32, Baldwin Serial # 62136. This small 900 HP locomotive was placed in service on the 19th December 1937. Engine type 8V0. 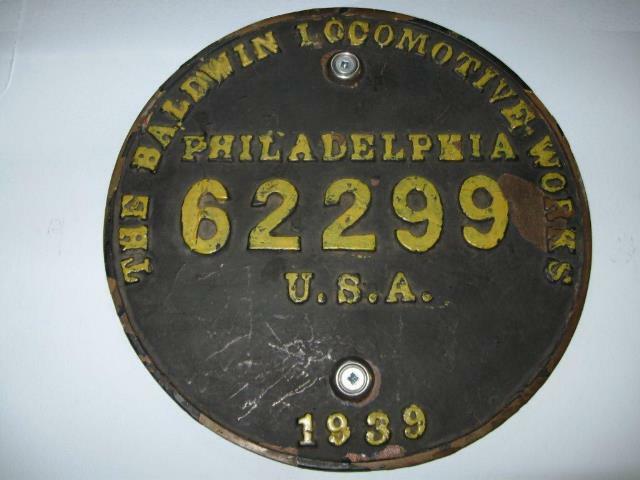 This builders plate is off the third diesel locomotive Baldwin ever built (as Santa Fe road # 2200 was the first and her sister locomotive NO&PB # 31 was the second). This locomotive is considered to be a pre-production locomotive as there were only three locomotives of this type and class ever built. 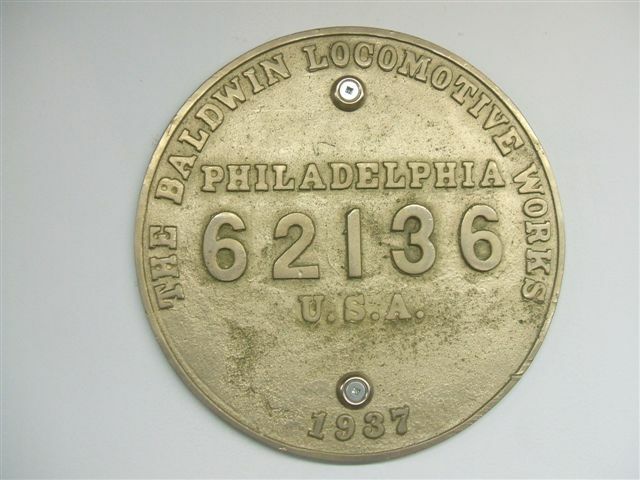 Soon after their completion Baldwin standardized on a production model and the production of the famous line of diesel locomotives started. This locomotive was retired in 1966. 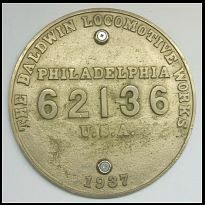 This builders plate is a round 91/4" diameter Baldwin plate (very much like the steam locomotives) and it's construction is almost like a Stainless steel / Chrome material (but I am no metallurgist) and as far as I can see these are the only Baldwin builders plates to be constructed in this manner. Completed on the 5th December under Baldwin serial # 62299 the first standard VO-model switcher rolled out of Eddystone's shop's. This locomotive has a DE LA Vergne, 660 HP, VO engine installed in it (designation 8-DE-660-1). 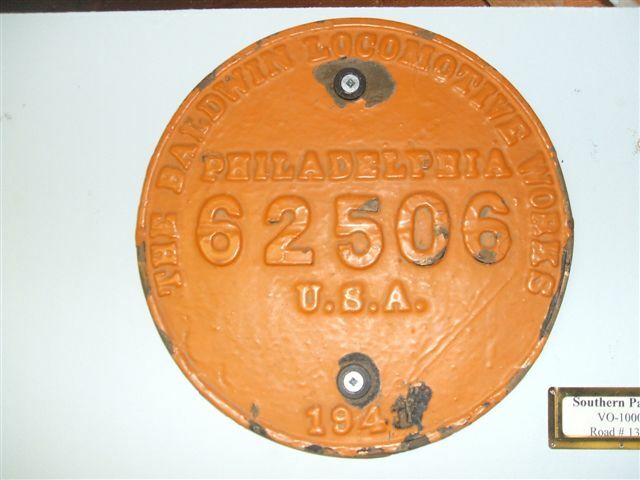 Numbered (road # 299) after her builders plate serial number this locomotive was used as Eddystone's plant switcher and in-plant demonstrator. The locomotive was one of only a handful built with the Oval front radiator grill (even though the radiators were on the side). The locomotive finally made it's way to the Lima-Hamilton works in Ohio, USA shortly after the merger of Baldwin to Lima-Hamilton where it was also used as their shop switcher and was finally scrapped on site. 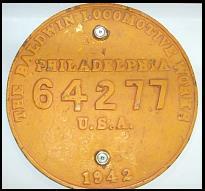 The Builders plate is a round 91/8" round cast brass plate in as removed condition. Class DRS-4-4-660/1 DE or also known as the VO-660. 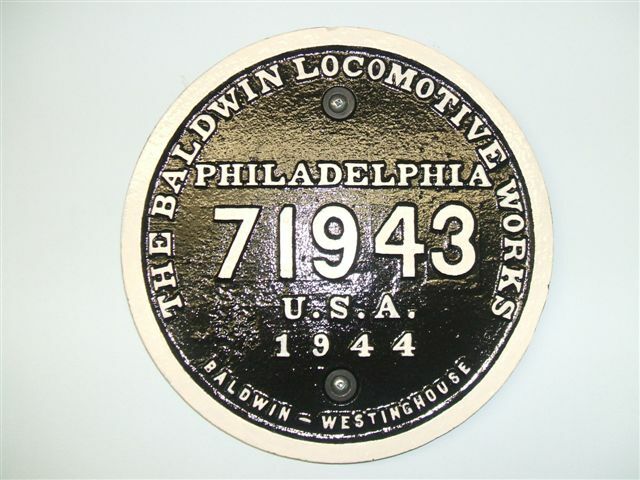 Baldwin Serial # 62497, delivered on the 28th July 1941. Engine type 6VO, Road # 200. This was the only VO-660 the Wabash owned. 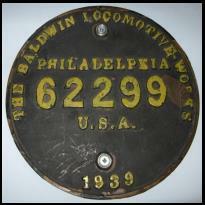 This builders plate is a brass round 91/4" diameter Baldwin builders plate in ex-locomotive condition. 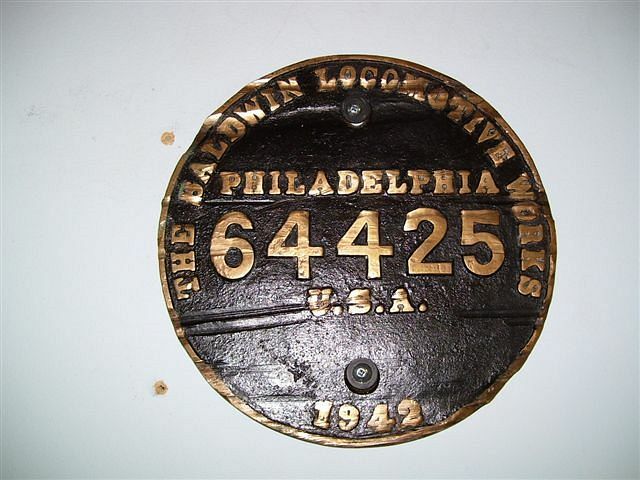 As you can see from the builders plate that the locomotive probably had a very rough life. Southern Pacific VO-1000. Baldwin Serial # 62506, delivered in July 1941. Engine type 8VO. Road # 1320. This was Southern Pacific's, first VO-1000 and built in a batch with fives sisters road # 1320 to 1324). The 1320 started her career in Los Angeles and was then leased to Pacific Electric in 1948. In 1964, now only 23 years old she was traded in to General Electric for the new U25B. 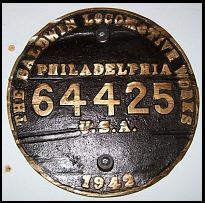 The Builders plate is a 91/4" diameter brass builders plate and very similar to the style used on Baldwin steam locomotives. Denver and Rio Grande Western, VO-660 (Phase IIa). Baldwin Serial # 64185, delivered in 18th August 1941. Engine type 6VO. Road # 71. The phase IIa models had the front radiator design and the cab shortened by 1 foot between April 1941 and November 1941. There were 142 qty VO-660's built all for the US market. 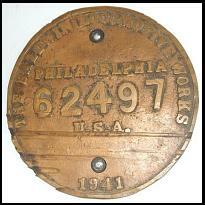 This is a round brass builders plate 91/4" in diameter.They were all scrapped or traded by 1967. Class 0-4-4-0 1000/1 DE or VO-1000 to the rest of us. Baldwin Serial # 64277, delivered on 25th March 1942. Engine type 8VO, Road # 911. This was one of fourteen VO-1000's on the Oliver Iron Mining site and had a phase 2a car body ( i.e. the front radiator design, cab shortened by 1 foot). This locomotive ran until September 1985. 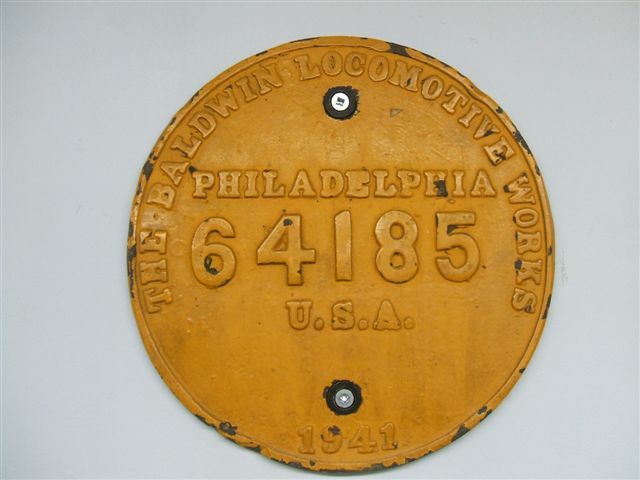 This builders plate is a brass round 91/4" diameter Baldwin builders plate (very much like the steam locomotive type) and is in ex-locomotive condition. This was one of the last 1000 HP switchers to be completed prior to the imposition of government control (for the war effort). Wabash Railroad # 300 was a VO-1000 built in September 1942 on Baldwin serial # 64425. This locomotive had a 8VO engine and fitted with MU connections at Decatur shops to work with Wabash 304 (a DS4-4-1000. The 304's cab was damaged in a accident and subsequently rebuilt into a calf). The 300 (cow) and 304 (calf) were the only cow / calf set built other than the S-8's cow and calf sets for Oliver mining. 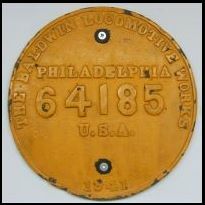 The plate is a 91/4" round brass plate and as you can see it's had a hard life. Pictures of the locomotive with it's calf can be found in The second Diesel Spotters Guide, page # BLW-292. Built for the Western Maryland in September 1943 under serial # 69661 she was built as a VO-1000 with a Road # 129. This locomotive was built with a eight cylinder VO engine (designation 0-4-4-0 1000/1 DE). This locomotive scrapped (probably traded into EMD like her sisters). 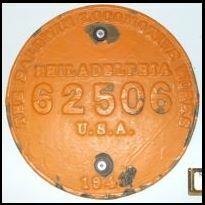 The Builders plate is a round 91/4" round cast iron plate in as removed condition. Great Northern Railroad, VO-1000. 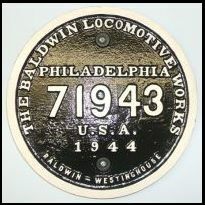 Baldwin Serial # 71943, delivered in September 1944. Engine type 8VO. 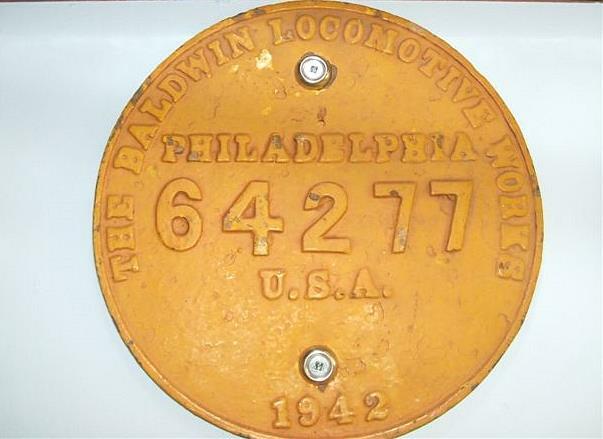 This builders plate is off road # 140 and was one of ten VO-1000's owned by the Great Northern Railway. This locomotive was one of a ten, VO-1000 fleet that the great Northern Operated (and was part of the last batch ordered). 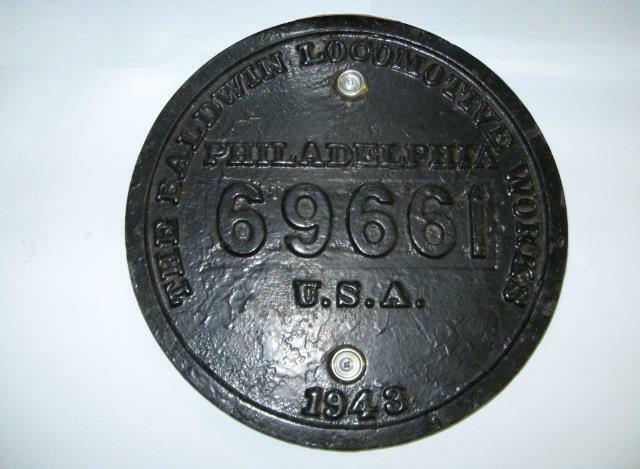 The builders plate is made from cast steel and is 91/4" in diameter. By 1944 the war department had stopped the locomotive builder using brass for the construction of their builders plates. 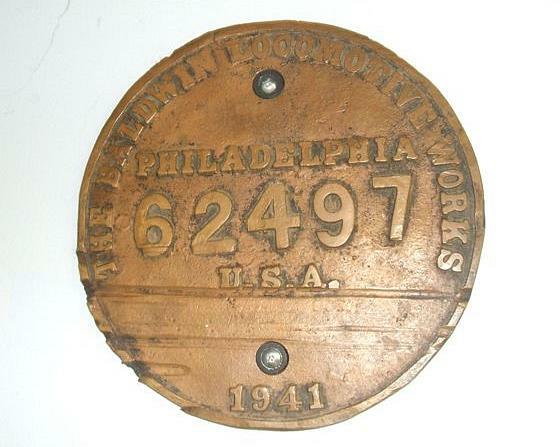 Note how much bulkier the cast steel builders plate is compared to the earlier bass plates. In 1963 the 140 met an unusual fate and was stripped down to the frame and trucks and rebuilt as a yard caboose. In this case it was Great Northern Caboose # X-179.